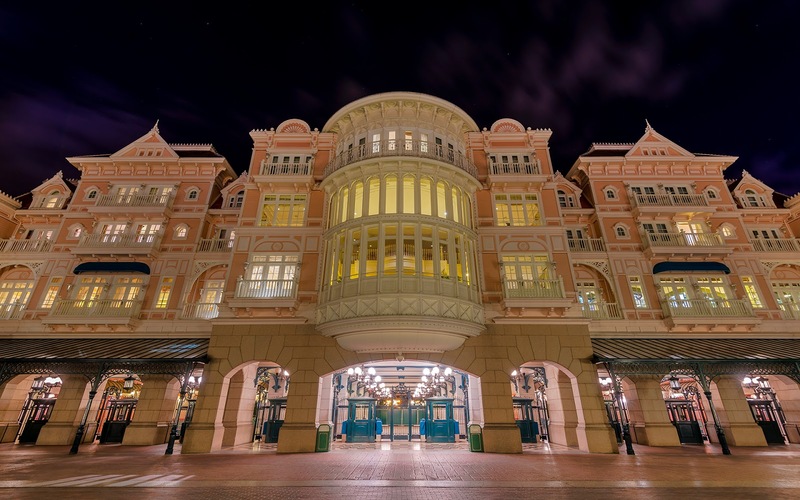 In my book, the two grandest entry portals into a Disney park occur at Tokyo Disney Sea and Disneyland Paris. Coincidentally, both involve walking through the public arcade supporting a Disney hotel into the park. I've written about Tokyo Disney Sea countless times, but I've rarely expressed how much I appreciate Disneyland Paris for pioneering this approach first and executing it with Victorian elegance and charm. It's a lovely scene by day or night, and I can only imagine how much lovelier it is to have a park-facing room inside the hotel! The Disneyland Paris Hotel and entrance to Disneyland Park after park closing.